Pat Hentgen was on a run in 1996. In 10 starts in July and August, Hentgen won nine times. He also threw four-straight complete games, The Associated Press wrote. It was enough for Hentgen to get talk for the Cy Young. It was also a big turnaround from the season before, where Hentgen went 10-14 with an ERA over 5. "Being able to spot my fastball on both sides of the plate, that's the No. 1 thing," Hentgen told The AP of his turnaround. "I struggled last year with that. That's been the big difference this year - being able to spot my fastball." For Hentgen, that Cy Young talk ended up more than just talk, it turned into a reality. Hentgen went on to pitch in 14 big league seasons, win 131 games and strike out nearly 1,300 batters. Hentgen also picked up a win in Game 3 of the 1993 World Series as he helped pitch his Blue Jays to the team's second world championship in as many years. 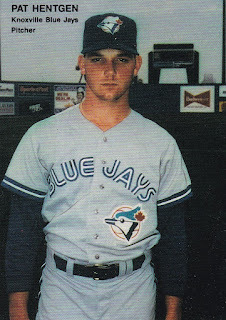 Hentgen's career began in 1986, taken by the Blue Jays in the fifth round of the draft, out of Fraser High School in Michigan. With the Blue Jays, Hentgen started at short-season St. Catharines. He didn't make AA until 1990 at Knoxville. He then made AAA Syracuse in 1991 and debuted in Toronto that September. With the Blue Jays that September, Hentgen got three outings, one start. In 1992, he got 28 outings, two starts. Then came Hentgen's breakout season of 1993. Turned starter, Hentgen got 32 starts, going 19-9, with a 3.87 ERA. He also made the All-Star team, and led the Blue Jays into the post-season. In Game 3 of the World Series, Hentgen went six innings against the Phillies, giving up one earned run. He also picked up the win. Before that game, Hentgen got praise from his manager Cito Gaston. "We wouldn't be here if it wasn't for Pat," Gaston told The AP. "He was our most consistent pitcher all year." That year ended up being the first of eight-straight seasons where Hentgen would notch double-digit wins. It was also the first of three seasons where he was named an All-Star. Hentgen ended up staying with the Blue Jays through 1999, when he was traded to the Cardinals. After a season there, he moved to the Orioles. He also developed elbow problems, undergoing Tommy John surgery in 2001. "Coming back from Tommy John surgery my location was pretty good, and the results were pretty good, but for whatever reason this year I never really located the ball really well," Hentgen told The AP in 2004. "I tried to do everything I could as far as making adjustments on the mound, but it just wasn't there. My heart is telling me it's time." Hentgen spoke to The AP in July 2004, after retiring mid-season. He retired after returning to the team where he had much of his success, the Blue Jays. Hentgen has since returned to the Blue Jays again, as bullpen coach. He's returning to that post for 2013. Hentgen worked with Ricky Romero in spring 2013, trying to get the young pitcher to bounce back from an off-year. "Sometimes as a good pitcher you’ve got to have a bad memory," Hentgen told The Toronto Globe and Mail. "Spring training is tough sometimes, you're trying to feel out your pitches and you can worry too much about results."